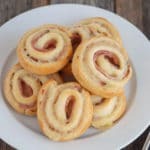 These easy Ham and Cheese Pinwheels take just five minutes and three ingredients to make and are perfect for snacks and lunch boxes. I grew up eating a version of these that my mom folded into a genuine-looking pinwheels (I shared the how-to over on Mom to Mom Nutrition). I also shared how to make them on Instagram Stories one day and didn’t think much of it. So I figured I was practically obligated to share them here, in case they’re a hit with your family too. 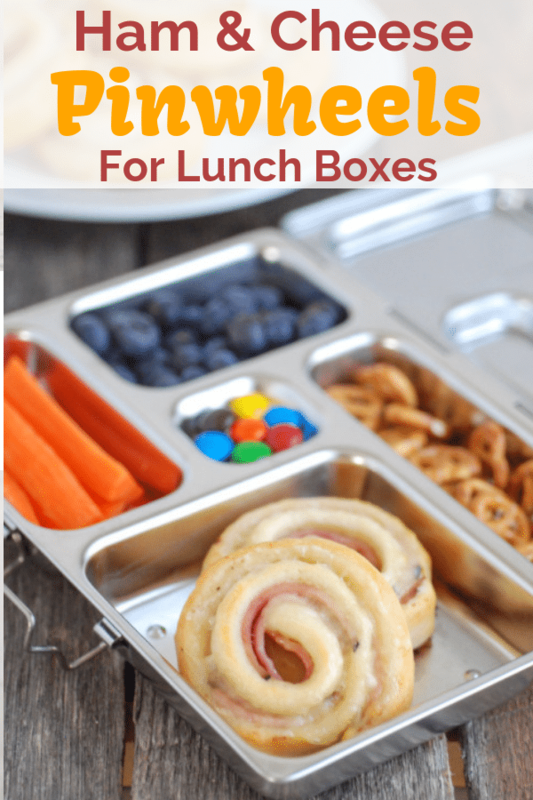 My kids love these hot for weekend lunches and cold in lunch boxes. Trouble is, the pretty pinwheel shape I was making didn’t fit in their bento boxes. So I tried a new tactic and now they work beautifully in their EasyLunchboxes, Bentgo Fresh box, and PlanetBox (that’s the one pictured above). And they’re just as simple and quick to make. Open the package of crescent roll dough. I like the Annie’s brand which, unlike some others, doesn’t contain hydrogenated oils or synthetic colors. Place the rectangles together to form one big rectangle and press the perforated edges together to seal. 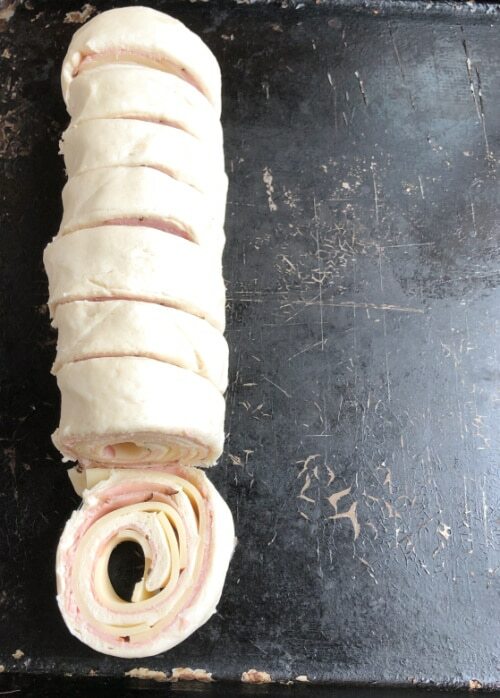 Layer on the ham and cheese and roll up, starting at one of the short ends. Using a serrated knife, carefully cut into slices. I cut mine into eight pieces. 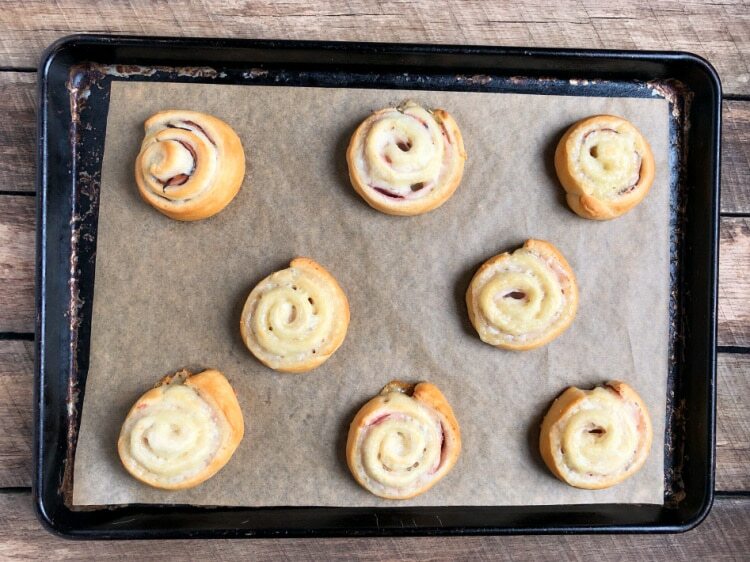 Lay on a baking sheet lined with parchment or a silicone baking mat to prevent sticking. They will spread a little bit while baking, so space them apart. Bake for 12-15 minutes at 375 degrees F until golden brown and melty. 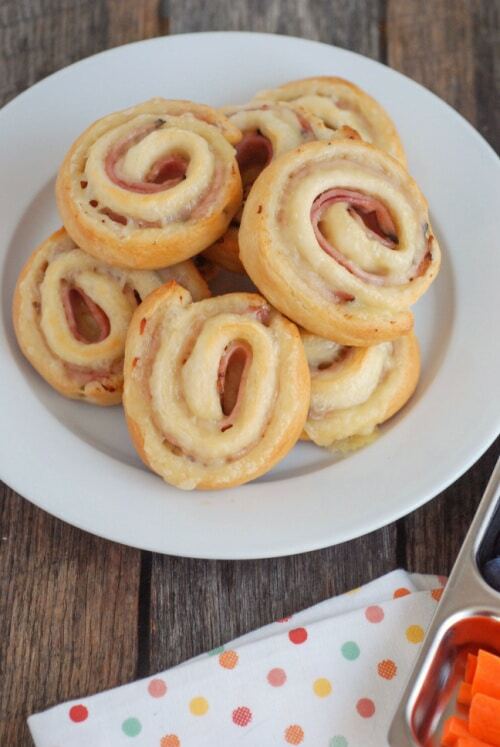 These easy Ham and Cheese Pinwheels take just five minutes to prep and are perfect for snacks and lunch boxes. 1 can refrigerated crescent rolls I like Annie's brand. 8 slices deli ham May need more or less, depending on size of slices. 8 slices swiss cheese May need more or less, depending on size of slices. 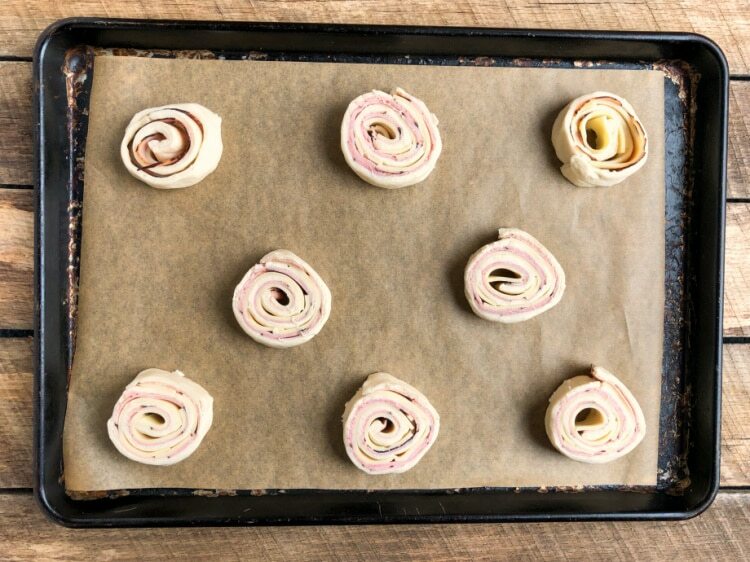 Open package of crescent rolls and unroll onto a baking sheet or cutting board, placing the four rectangle pieces together to form one big rectangle. Pinch the perforated edges closed to seal. Layer on slices of ham to cover entire surface area. Cover ham slices with cheese. Starting at short end, roll tightly, jellyroll fashion. Slice carefully with a serrated knife into 8 even slices. 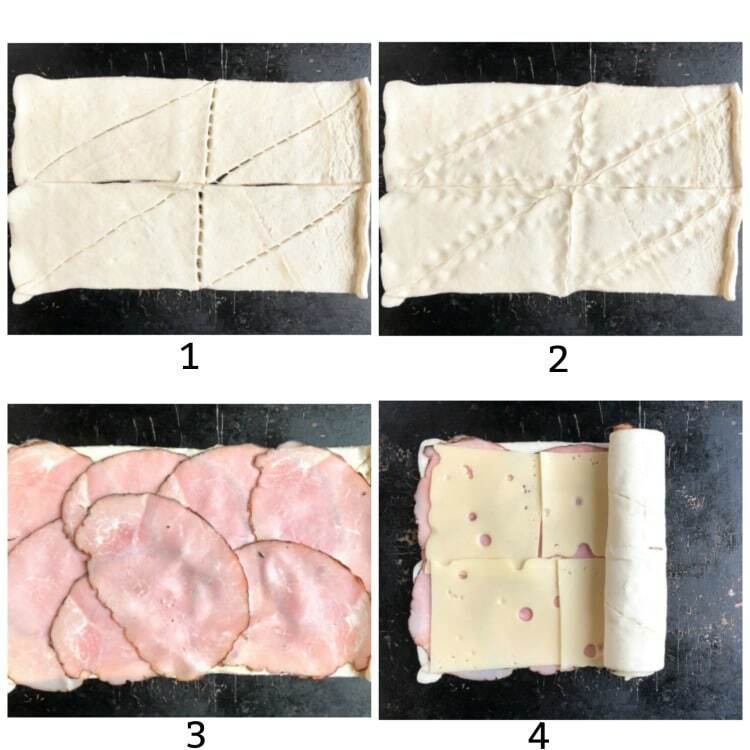 Place slices on a baking sheet lined with parchment or a silicone baking mat. They will spread while baking, so space them with some room between. Bake for 12-15 minutes or until golden brown and melty. 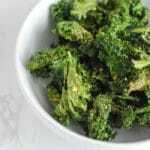 Remove to a cooling rack and serve while warm or refrigerate after cool in an airtight container. Use within 3-4 days. I love this idea! 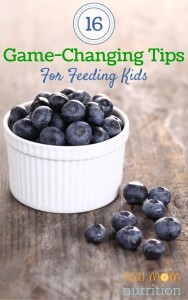 I’m always looking for new ideas for my son’s lunches. I also use the PlanetBox lunchbox. I’ll keep an eye out for Annies crescents. I love their products. Thanks for the post. Thanks Hannah! Hope you try them and like them. Just what I needed to get out of the pb&j blues. Made them tonight for lunches- my girls are so excited to eat these. Thank you! Hooray! Hope they love em. I so enjoy your blog. 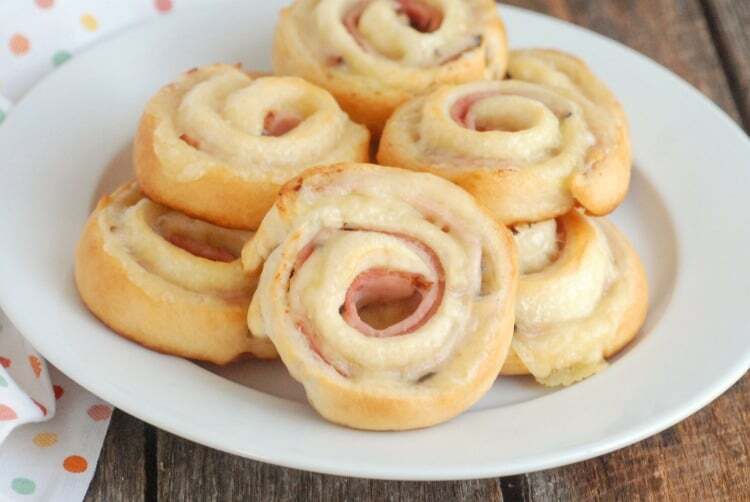 I am taking the Ham and Cheese Pinwheels to my grandsons tomorrow. I’ll let you know what they think! Thank you Ruthie! Hope they love them! These were a HUGE hit with my daughter and my husband today! I have run out of ideas for lunchboxes, but now that this is “approved” I have another option. 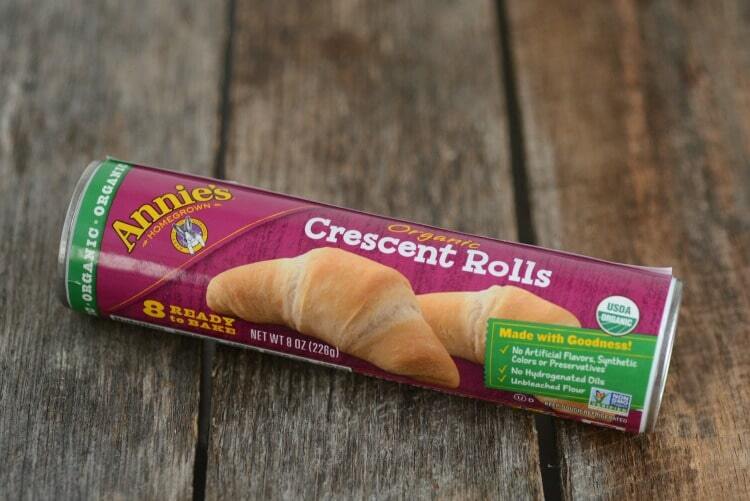 I couldn’t find the Annie’s crescents but I’ll keep an eye out for them. Super fast and easy to make. 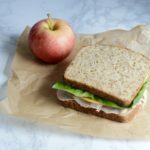 I made a double batch of these last week– one ham and swiss and one turkey and cheddar. All three school age kids loved them, including the non-sandwich eater! It’s pretty much unheard of for them to have a unanimous consensus on food. 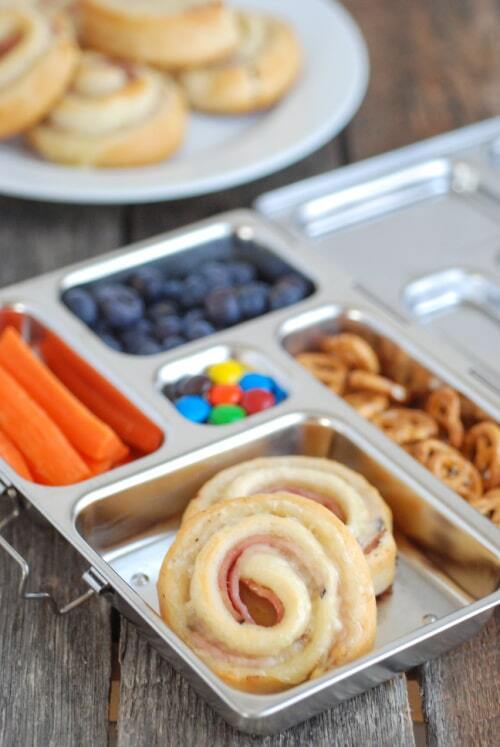 Thank you for this yummy lunch idea! I made a batch this morning before school. My seven year old ate a pinwheel and gave a big He said he can’t wait until lunchtime at school. At pick-up he asked if he could have another for after school snack. 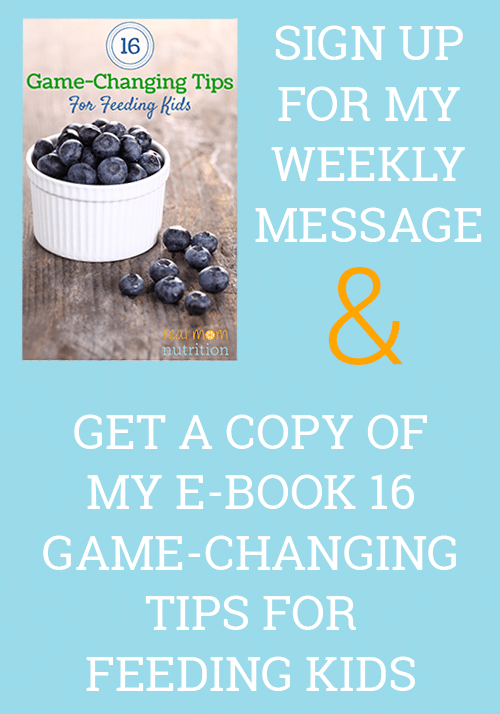 My son asked where I got the idea and I showed him your blog, he said you’re the coolest! Can you buy the Annie’s dough in Canada? I haven’t seen it, but also never looked for it cuz I didn’t know it existed! Or you can use any kind of crescent roll dough instead. Thanks! Finally made these! My very quiet 17 year old walks by as they are cooling and pops one in his mouth says “these things are really good” most he’s said all day 🙂 the picky 13 year old is dipping them in salsa. Thanks Sally! That’s great to hear, Amy! That’s a great question Mary. I haven’t tried it yet but I will. I don’t see why you couldn’t freeze and defrost them, then pop into the toaster oven or regular oven to crisp up. 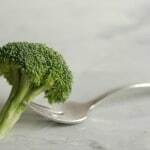 Incredibly simple to make and so tasty! 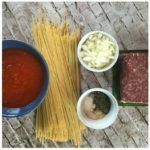 I paired these with some tomato soup and it was a hit!